More than 2000 people, including families visited Thumbay Medical & Dental Specialty Center, Sharjah to attend the free mega health camp organized as part of Thumbay Group’s CSR program, on Friday, 16th February 2018. Organized with the aim of promoting health awareness among the public and offering them easy access to quality healthcare, the camp offered specialist consultations, medicines, laboratory investigations, X-ray, ECG and Ultrasound services; all completely free of charges. Held from 9am to 9pm, the event offered free healthcare services including specialist doctor consultation and blood sugar / blood sugar / BMI checkups. A team of specialist doctors, consultants, nurses and volunteers conducted consultations and checkups across various specialist departments. Patients requiring diagnostic examinations were tested and their results issued immediately, enabling the dispensation of free medicines without delay. Dr. Thumbay Moideen, the Founder President of Thumbay Group said that regular health camps organized by the group were intended to benefit the public, as part of Thumbay Group’s CSR drive. “This is our way of giving back to the society,” he said. Mr. Akbar Moideen Thumbay, Vice President of the Healthcare Division of Thumbay Group said that the free medical and dental camps organized under the healthcare division were highly beneficial for the people, not only by giving them cost-free access to high quality healthcare services, but also by promoting health awareness. “In addition to making a conscious effort to raise awareness on lifestyle-diseases, the camps also stress the need for early detection and prevention,” he said. Families and people of all age groups attended the camp. Mr. Sohail, an Indian national who attended the camp along with his family, said that they found the event very helpful, especially since it included free diagnostics and medicines, in addition to consultation. “We came here today to consult the GP and Pediatrician. For a free medical camp, we are highly pleased by the service given to us by the doctors, nurses and technicians. We feel that the doctors and staff here are very friendly and patient, making an extra effort to ensure that we were at ease. 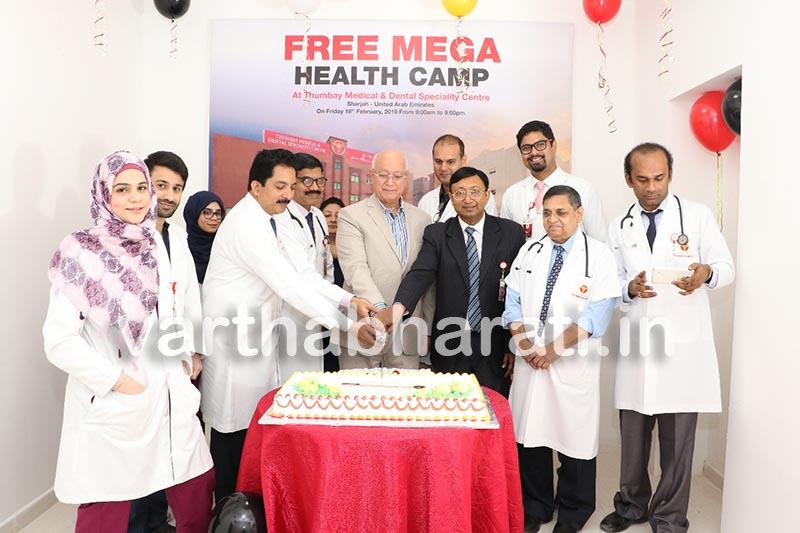 A remarkable feature of this camp is that in spite of the huge crowd who have turned up here today, all the tests, consultations and medicine dispensation are being handled systematically, ensuring minimal inconveniences for visitors,” he said. Thumbay Medical & Dental Specialty Centre, Sharjah is a full-fledged multi-specialty center with state-of-the-art facilities providing quality healthcare at affordable costs. This center also supports the clinical teaching activities of the College of Dentistry, under Gulf Medical University. The hospital has facility for outpatients, pharmacy, radiology and a laboratory, benefiting patients from the area. It is equipped with various specialty departments & services supported by highly qualified and experienced doctors, strong team of nurses, paramedics & technicians. The Thumbay network of academic hospitals is now the largest network of private academic hospitals in the Middle East, treating patients from around 175 nationalities. It is also one of the biggest JCI-accredited private academic hospital networks in the region. Thumbay Group’s healthcare division also operates a chain of family clinics (Thumbay Clinic) and multispecialty day care hospitals (Thumbay Hospital Day Care) in the UAE as well as diagnostic labs (Thumbay Labs) and pharmacies (Thumbay Pharmacy) in the UAE and India. The hospitals and clinics are presently located at Dubai, Ajman, Sharjah, Fujairah, Ras Al Khaimah and Umm Al Quwain in the U.A.E. and in Hyderabad—India. Thumbay Medical Tourism, which promotes Thumbay Group’s ultra-modern healthcare services to international patients, is tied-up with 87 countries through representative offices. The Thumbay academic hospital network will have a total of 1000 beds in the UAE, 1500 beds in India and 750 beds elsewhere in the Gulf and Africa by 2022.